from the agave plant and known in Mexico as aguamiel, or "honey water." 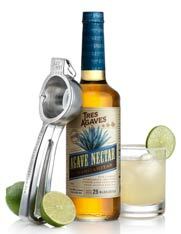 Agave (pronounced ah-GAH-vay), the the plant from which tequila is made, is also the plant from which Agave Nectar is produced. The nectar (also called agave syrup) made from the agave plant is known in Mexico as aguamiel, or "honey water." Sap is extracted from the Agave piña, filtered, and heated at a low temperature, which breaks down the carbohydrates into sugars in the process of making agave nectar. Agave is 1.4 to 1.6 times as sweet as sugar, says Sabra Van Dolsen, president of Colibree Co., an Aspen, Colo., company that sells Nekutli brand agave nectar. Agave is not just for tequila anymore. The sap from the Mexican plant is now increasingly being sold as a natural sweetener called agave nectar. The Truth About Agave - WebMd.com - The bottom line is that refined agave sweeteners are not inherently healthier than sugar, honey, high-fructose corn syrup, or any other sweetener. Nutritionally and functionally, agave syrup is similar to high-fructose corn syrup and sucrose (Karo) syrup. It does contain small amounts of calcium, potassium, and magnesium, but not enough to matter nutritionally. Agave nectar has come under some fire lately, and a recent report from The Weston A. Price Foundation basically says that it’s as bad for our bodies as high fructose corn syrup (HFCS).